Men’s Leather Shorts Sepp in Antique Brown with Belt. These bold leather shorts really help to create the classic look and the antique brown leather is certainly very rugged. 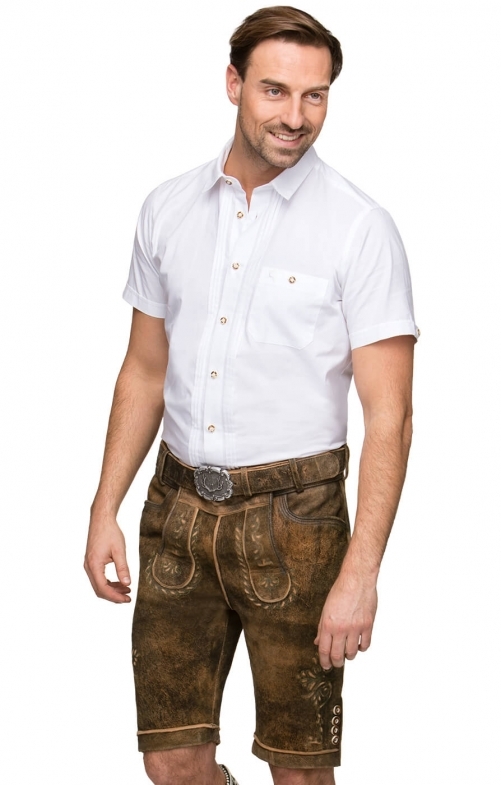 The leather shorts have been created in the classic German style that features a traditional bib at the front that is held in place with two horn buttons. Two additional buttons on either side can be used to attach traditional leather braces, while the modern belt that is supplied makes the shorts very versatile. The shorts are embossed with a traditional German pattern, while the piping and rows of buttons on each cuff complete the look.